With the rapid advances in the genetic diagnostic testing industry, the role of a genetic counselor has never been so critical. The genetic counselor supports both physicians and patients by identifying your baby’s genetic risks and communicating this information in layman’s terms. 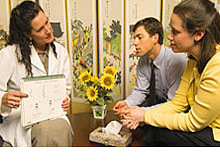 Genetic counselors are also available to consult with patients and couples prior to pregnancy. Answers patient questions during the session and is available subsequently by telephone.